Ethylene oxide gas (EtO) is widely used to sterilize materials and products that would be damaged by methods involving heat, moisture or radiation. Depending on industry standards, EtO can be used to reduce or inactivate the microbial population of a product or material. EtO Sterilization Inc. provides contract sterilization services for more than 200 customers from its three Northern New Jersey facilities. The company’s custom sterilization cycles can meet special needs. EtO sterilization is based on a process that involves careful control of temperature, humidity, time and gas concentration. Working concentrations of gas are typically 400 to 600 ml/liter in the sterilization vessel. Typical exposure times range from 6 16 hours. When sterilization time is complete, the gas is removed from the chamber by a vacuum pump and sent to a scrubbing system which absorbs and eliminates the EtO. Sterilization has two main objectives. While the obvious one is health protection, sterilization is also useful in increasing shelf life of treated materials. The company’s Linden facility is operating an EtO sterilization vessel, specializing in sterilizing food ingredients. The Linden plant processes spices and herbs that are subject to natural contamination. These spices include black pepper, allspice, oregano, pimento, parsley and cinnamon. Other food components such as gums, starch and nutmeats are being routinely sterilized for increased safety and extended shelf life of the ingredient or the final food product. It is essential to neutralize the EtO gas that is removed from the system at the end of a sterilization cycle. 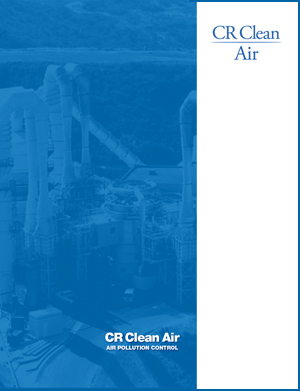 Using a scrubber designed by the Clean Air Group, LLC the company hydrolizes water-soluble EtO gas to ethylene glycol. After the EtO is converted to glycol, a relatively inert and harmless chemical, the scrubbing system can be used as an antifreeze to keep the outdoor system operational throughout the winter. When the holding tank is nearly full, it is drained. The Linden system consists of a specially designed tower, 24 inches I.D. by 28 feet overall height, containing high performance polypropylene packing. A large holding tank, valves and recirculating pump complete the system. Gas from the sterilization vessels is directed to the scrubber and is channeled upward through the packed bed. Scrubbing liquid counterflows downward, through the packing, by gravity. In the process, intimate mixing and absorption of the gas takes place. A mist eliminator at the top of the packed bed prevents any entrained liquids from escaping with the vent gas.